Looking for a really cool way to clean up some of your digital imaging clutter? A relatively new site called FractureMe offers a very unique print-on-glass service that produces stunning results at very affordable prices. 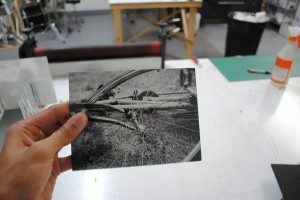 The process of taking your digital images and turning them into a prints on glass involves an interesting technique that starts as basic raw materials: sheets of glass and stacks of foam board. The image you upload to their site is printed directly on the sheet of glass. Forgive the brain trust at FractureMe if they are bit secretive about the entire process as there are a few Slugworthesque characters lurking around out there looking to poach ideas. The FractureMe.com site also offers a variety of borders you can add to the image or you can simply request a borderless option. Various shapes (landscape, square, portrait) sizes are available as well with a 5×7-inch Fracture priced at $8 – on up to an 11×14-inch size that will cost $25.